Learn something new each day! That was the one piece of advice from last month’s "10 ways to de-stress your day hour by hour” that I got by far the most follow-up questions and comments about. And I’m super glad you guys are so interested in that, because I am too! For me, learning is a hugely important part of living mindfully each day. It helps me de-stress, it broadens my horizon and gives me new creative energy. Most people overestimate how long it takes to learn something. Perhaps that’s because they’ve heard about the 10 00 hour rule, according to which it takes on average 10 000 hours of deliberate practice to master a skill. But here’s the thing: Unless you want to become a world famous pianist or compete at the olympics, you don’t have to achieve mastery to get to a level you can be proud of or to enjoy playing the piano or running or anything else that you want to do. And while true mastery might require a huge time investment, you can get good at most skills pretty quickly. For example: It takes about 3 months of full immersion to be able to converse comfortably in a new language, or about a year of weekly lessons. After 20 hours of coding practice most people will be able to confidently tweak a basic website template into their dream design. And just by reading a good introductory book on a topic you’ll already know way more about it than the vast majority of people. In one lifetime, you can actually learn a ton of different things, especially if you make learning a regular part of your weekly (or even daily) routine. 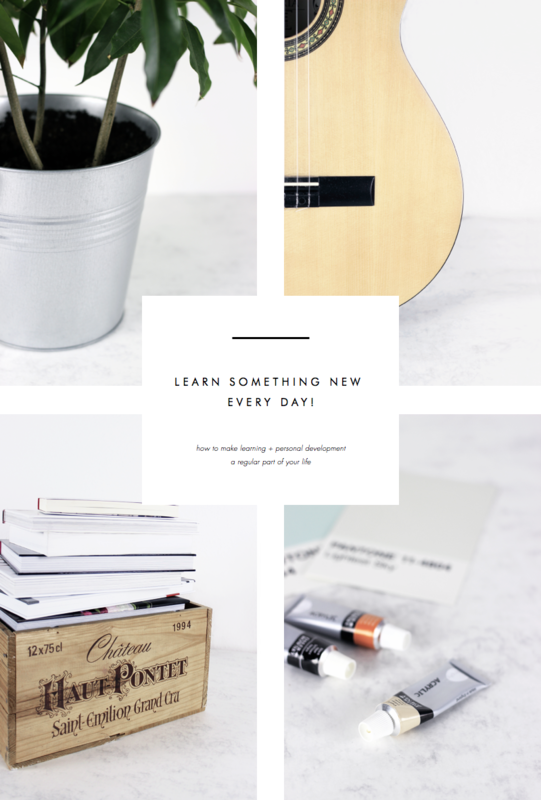 What you will find in this post: All about how I tend to approach a new skill or topic and how you too can incorporate regular learning into a busy schedule and actually stick with it. A lot of you also wanted some advice for what kinds of things to learn, and I’ll cover that first. At the end, I’ll also give you a list of my favourite online resources for learning, to get you started. I want to learn stuff! But I don’t know what! The most crucial step to successful learning is choosing the right skill or topic in the first place. Don’t even consider dedicating any effort towards something that doesn’t interest you, just because everyone else is doing it, because it would look cool on Instagram, etc. Both your time and energy are precious and limited, so make sure you only spend them on things that are meaningful to you or that you enjoy. Ask yourself: What have you always been curious about, what have you always wanted to be able to do, what looks like a ton of fun? If your schedule is super busy, remember that the scope of your learning is completely up to you. You can dedicate a full week to learning how to meditate at a retreat, you can sign up for a weekly pottery class or you can just brush up on your Spanish vocabulary during your commute. You don’t need to be able to spend a lot of time on a skill to make it worthwhile. Even after fifteen minutes of practice you’ll have improved, even after reading just ten pages you’ll know more than before. So never let a busy schedule keep you from learning what you want to learn and discovering new things, because every little counts. Even if you are just learning something new for the fun of it, it’s a good idea to do so with an end goal in mind, i.e. an event in the not-so-distant future when you can utilise your new skill or knowledge. For example, if you want to dust off your high school French, you could plan a trip to France for next fall. If you have a blog and want to get better at photography, come up with a cool photo-based series that you can implement in a few weeks time. If you want to get into woodworking and DIY, set yourself the goal of being able to build a bench for your garden in time for summer. The idea here isn’t to add additional pressure for yourself (if your goal has that effect, tone it down), but to motivate you and give you something concrete to work towards. Once you have come up with a fun goal, it’s time to figure out how you want to approach your chosen skill or topic. Do you want to take a class, a workshop or lessons with a personal trainer/instructor, or do you want to start by working your way through a book, and online class or some other type of learning material? The key is choosing a method that aligns well with your personal preference for studying so you’ll enjoy it more and also make better progress. I prefer learning on my own and never really found listening to people explaining something all that helpful, but many of my friends are the complete opposite and would much rather learn through discussion with others. Whatever your preference, take your time to compare all of your options before you take your pick. If you are taking a class or working with an instructor, this step will be taken care of for you, but if you are going solo I’d definitely recommend you spend some time familiarising yourself with your chosen learning materials and then figure out a simple study plan. For example, if you want to learn a language, you may decide you want to work through two chapters a week of your textbook and on top of that chat to a native speaker over Skype once a week. Of course, you can always adjust your plan at a later point, but working with a clear direction from the start will help you make better progress and that is always the best motivation. To really make learning a habit and help you stick to your study plan, try reserving certain time slots in your week for each of the skills you want to learn. If possible, tie your study sessions to a different activity that you are already doing regularly. For example, you could say that every week on sundays after your trip to the farmer’s market you will dedicate one hour to trying out a new recipe. Or every morning after breakfast you will spend 10 minutes playing the guitar before you head out to work. One last totally optional, but fun tip: Get yourself a little notebook to keep track of every new milestone, your study plans, your thoughts on your progress, and to note down everything you might still want to learn in the future. I keep a dedicated learning notebook in my Evernote, where I have separate notes for things I still want to learn, a journal-type log of my progress and a list of all the books I have read and am reading this year. "Josh Kaufman: It Takes 20 Hours Not 10,000 Hours To Learn A Skill” - A Forbes interview with Josh Kaufman on the importance of choosing the right skills to focus on and the basic process of learning any skill from scratch. "Carol Dweck: The power of believing that you can improve” - A very motivating TED talk about cultivating a “growth mindset”. Coursera - Coursera partners with universities from around the world to offer free online lectures including tutorials, quizzes, graded assessments and final exams. The range of courses you can take on Coursera is enormous, they cover everything from languages, social sciences and humanities to stuff like physics, engineering and computer sciences. Definitely check it out! W3 Schools - Great, very easy to follow coding tutorials. Lynda - Offers online tutorials on a range of topics including design, videography, developing and business. I don’t have any experience with Lynda yet, but I’ve only heard good things. Duolingo - Online language classes with gamification aspect. Italki - Connects you with native speakers from around the world for one-on-one classes or language exchanges. Memrise - Offers mnemonic flashcard-based courses mainly for learning vocabulary but also other topics like history, geography and science. If you know any more tips or learning resources, let me know in the comments! What do want to learn this year?